Risotto is an Italian favourite that has been enjoyed around the world for generations. Originally a starter it’s now enjoyed as a substantial, creamy supper with unlimited variations which can be adapted for any occasion. There’s no reason why anyone following a low-calorie diet should consider it off-limits. Cooked in the right way, it is the perfect low-calorie dish with just 300-350 calories per portion. Start by spraying a hot pan with a mist of good quality olive oil. Gently fry the onions and garlic until softened. If you are using vegetable, seafood or chicken, add them at this point. Don’t let them take on any colour; they just need to be cooked through a little. Now add all the Arborio rice with another spray of oil. Make sure that each grain is lightly coated with the oil and thoroughly mixed with the meat, fish or vegetable mixture. You need to start adding the cooking liquid now. Add one ladle at a time and when each lot of liquid has been absorbed by the rice you can introduce the next. It will take about 30-35 minutes for the rice to soak up all the liquid, stir continuously to stop the rice from sticking or catching the bottom of the pan. When you have reached this point, make a final adjustment to seasoning. A lot of chefs will finish their risotto by stirring lots of butter through the finished dish before serving and by mixing in large amounts of freshly grated Parmesan cheese. Cooked in the right way, though, risotto will be delicious and creamy without adding the extra fat. Finish your risotto by stirring through a dollop of low fat fromage frais if you wish. Instead of adding in the Parmesan, serve it at the table. This allows the diners to control the extra calories in the dish. Risotto is a complete meal by itself or you can serve smaller portions with fewer ingredients alongside simply grilled chicken or fish. Once you know the basic method of cooking risotto, the rest is a question of experimenting and choosing individual ingredients that fit in with your low calorie diet. Risotto offers the chance to select so many taste combinations and use of seasonal ingredients. You need never eat the same risotto twice! You certainly can’t get bored with this low-calorie recipe. The key to a good risotto is using the right rice. Long-grain rice won’t produce the same results. You need to use a short grain like the Arborio or Carnaroli varieties. They both produce enough starch during the cooking process to give a rich, creamy finish. Cut out the butter and Parmesan cheese. Stick to olive oil misted into the pan when needed and a flourish of low-fat fromage frais instead. Parmesan cheese is much lower in fat than other cheeses and has a good strong flavour. It is also the traditional cheese used for risotto, so you won’t be making any compromises except serving it on the side instead. These are really important ingredients in a good risotto. The dish always starts with a soffrito, which is the Italian term for the onion and garlic base. Good vegetables to use might be mushrooms, butternut squash, asparagus and peas. If you are worried about your vegetables turning into mush while the risotto is cooking, it’s perfectly acceptable to cook them separately and add them just before serving. For example, you can roast butternut squash separately with minimal fat and add the vegetable just before you serve the risotto. Always remember that your choices will affect the final calorie count, so stick to sensible choices like chicken or seafood. Use a good stock, preferably vegetable or chicken. For a special touch, the first few additions of liquid to the rice could be white wine. The alcohol will cook away but it will infuse the finished dish with a delicious flavour. Remember, wine will increase the calorie count though. 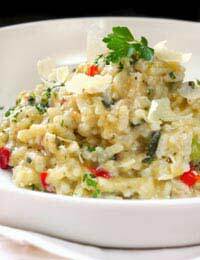 Risotto is an excellent choice on the low-calorie menu. Master the basic recipe and you always have a delicious, healthy and filling meal at your fingertips, just by using simple items from your store cupboards and vegetable rack.